A creamy topping hiding ripe figs and apricots is an easy dessert to make for a barbecue supper. Make in advance and finish off before serving. Roughly crush the biscuits and place in a large bowl, then pour the brandy over. Slice the figs and apricots and place on top of the biscuits. Spoon the compote over the fruit. Layer the yogurt on top of the fruit and chill until ready to serve. Just before serving, drizzle the trifle with a little honey and top with a few toasted flaked almonds. 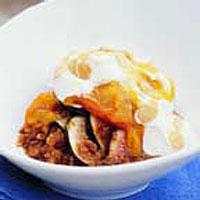 The trifle can be made the day before and then decorated with honey and almonds before serving.